University of Alberta paleontology graduate student Scott Persons research shows how dinosaurs used large tail muscles to run faster. 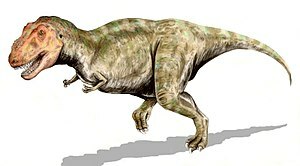 Carnotaurus and Tyrannosaurus rex. both have a muscle and tendon structure connecting the tail to the back legs. When flexed this muscle pulled the leg backward and gave the dinosaurs more power and speed enabling them to run faster. Read more at PHYSORG.org Prehistoric speedway: Super-sized muscle made twin-horned dinosaur a speedster.